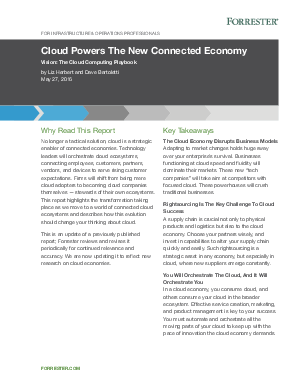 The cloud economy disrupts business models—adapting to market changes is hugely important to your enterprise’s survival. Businesses functioning at cloud speed and fluidity will dominate their markets. These powerhouse “tech companies” will take aim at competitors with focused cloud—crushing traditional businesses. Rightsourcing is a key challenge to cloud success—a supply chain is crucial not only to physical products and logistics, but also to the cloud economy. Choose your partners wisely, and invest in capabilities to alter your supply chain quickly and easily. Such rightsourcing is a strategic asset in any economy, but especially in cloud, where new suppliers emerge constantly. You will orchestrate the cloud, and it will orchestrate you—in a cloud economy, you consume cloud, and others consume your cloud in the broader ecosystem. Effective service creation, marketing, and product management is key to your success. You must automate, integrate, and orchestrate all the moving parts of your cloud to keep up with the pace of innovation the cloud economy demands.